I aim to deliver basic, yet informative guides to the way I play certain Gods. Ares is best played as a Magical Damage Tank. He can give a team a massive advantage over the enemy, carry many Aura buffs and set up team fight after team fight. I found when playing Ares It is best to take Meditation. This will allow you to go into any fight knowing that you won't run out of Mana and Ares really does use a lot of Mana, especially when using Shackels three times to initiate a Fight. By building Ares with Aura items you will become a serious essential to you team. Not only will you be giving your team Buffs from your items, but you will also be granting your team major Resist with Bolster Defenses. Purchasing 5 Healing Potions will be enough to last and seriously help your early game sustain, allowing you more opportunities for kills and helping you push the tower you so hopelessly desire to crumble. Healing Potion's combined with Health Buff can fix you up from the edge of death. Meditation is very effective when playing Ares simply because in fights you will use a tonne of Mana. Casting Shackels three times allows you to deal some serious Damage but is your main Mana consuming ability. The beginning of your Tankyness. This is a solid core item for any Tank and Ares isn't any exception. They offer great Movement Speed and both forms of Resist. Mystical Mark is an ideal item for Ares as it gives early Physical Resist and an Aura which will aid your passive whilst helping you clear minion waves and Health Buff. This item should be took second when laning up against Physical Damage dealing gods. This item is your second item which gives Resist, Magical Resist to be precise and will help you defend against mid lane ganks and any Magical dealing gods. This item should be took third after Mystical Mark if the enemies in your lane are mostly Physical Damage Dealing gods. If most of the enemies damage is Magical then make sure to tske this second as it will be much more helpful earlier on. Another Aura item which aids Ares' passive whilst increasing the amount of damage you will be able to pull off. Not only will it increase your damage but it will also increase the Magical Power of your fellow team mates. An alternative to this item is Warlocks sash although as Ares it can be quite hard to farm the 80 marks and it doesn't actually offer as much damage as this item does when hes Passive comes into play. Yet another Aura item to assist your passive but mainly for the Physical Resist bonus it gives your team mates. If the enemy team isn't dealing much Physical Damage then make sure to drop this item and take a Magical Power item like Gem of Isolation. A final Stone of Gaia will give you that crazy HP5 that every Tank needs. This item will round of your build and will enable you to enter a fight, come out of it alive and to then simply regen your health back. I prefer to take this item of Gauntlet of Thebes because the gauntlets require the user to get last hits and with Ares' lack of minion clearance this can pose very hard. Ultimate CC! Well, not really but it will help. In sense this will double the amount of Slows you have. When chasing an enemy you can firstly pop Shackels for the built-in slow and then as soon as this drop off you can pop Searing Flesh to further slow the enemy for an even longer duration. If you are quite good at landing final hits and building items then consider taking this item as your second item. It will increase you health vastly and give you some awesome early game Sustain. When taking this item make sure to drop Stone of Gaia as no more Hp5 is needed. An item for a build which doesn't take advantage of Ares' passive. Although this item doesnt give an Aura it is still very good to get as focusing Aura item entirly isn't viable. It will give you some MP5 and and a nice amount of Physical Resist. An awesome ability to take and an almost essential is Meditation. Take it on personal preference. I personally like to always have mana or know that if I go into a fight i will have Meditation to pop so as I can actually still cast skills. It will really help you in the laning phase by increasing your sustain, almost doubling the amount of time you can stay in your lane. This works wonders when combined with No Escape. One of the problems we all encounter when trying to hit 5 enemies with No Escape is the fact that enemies RUN like babies! Heavenly Agility allows you to run into the enemy team unexpectedly fast and almost 5 pick ups at a time! Each completed aura item that Ares owns grants him 40 additional magical power. The main thing to remember when using this is to not entirely focus on build all Aura items. It is a sweet little passive but don't focus on it as after all you are a tank. My main build 'Solid Tank' does have quite a lot of Aura items but this is purely because they are there because they are good, not just because of his passive. Chains extend from Ares' shield, doing 25/45/65/85/105 (+15 percent of magical power) magical damage to all enemies in its path. Hitting a god shackles them to Ares, dealing the same damage every second for 4s while slowing them and buffing Ares by 20%. While shackled, Ares can fire a chain for free within 2s, max of 3. This skill has the ability to be cast 3 times. This doesn't mean go around spamming like a crazy mofo. As at the moment each cast costs mana so only use it three times when going into a fight. If using it to poke the enemy then only use it once as hitting this 3 times will drain your mana and it wont be worth it as you wont get you a possible kill. Ares strengthens the defenses of himself and all nearby allies, granting 15/20/25/30/35 physical and magical protection and reducing crowd control durations by 15/20/25/30/35% for 8 seconds. For each shackled enemy, the protection buffs are increased by 10. The biggest thing that people forget about this skill is that it is improved in corrolation to the amount of Shackles you have currently landed. Use this skill after landing as many Shackles as possible. Flames pour forth from Ares' shield, engulfing enemies in a cone in front of him for 15/20/25/20/35 (+7% of magical power) plus 1/1/2/2/3% of the target's max health as magical damage every .5s for 4s. A good damaging ability that allows you to run whilst casting it. If you have build a Gem of Isolation then cast this after casting Shackles as you will benefit from a double slow. If you havent too a Gem of Isolation then hit the enemy with as many Shackles as possible and then cast this straight away. Your damage even though playing a tank will be quite significant. Ares throws chains out to all enemy gods in an area around him. All enemies hit by the chains are pulled to Ares after 2.5s, taking 200/275/350/425/500 (+40% of magical power) magical damage and are stunned for 1s + .3s for each enemy god chained. Ahhhhhhh, what a nice skill to have. No Escape is seriously hurt by Purification Beads no doubt about it, however it doesnt render Ares' ultimate useless. Purification Beads has a 120 second cooldown/ No Escape has a 90 second cooldown. This means that after casting No Escape the enemy will be forced to use their Purification Beads. Now, in 90 seconds you will have a 30 second window in which No Escape can be cast again whilst Purification Beads are on cooldown still. This is very Important to keep in mind during the early laning phase as it's very easy to keep track of which enemy has used what and what their cooldows are. This ultimate is the reason to why Ares' can lane with so many people. Simply pick up the enmy and place them right down infornt of your lane partner ready for your teammate to pull of what ever combo they need to. This build focus' on building Resist. 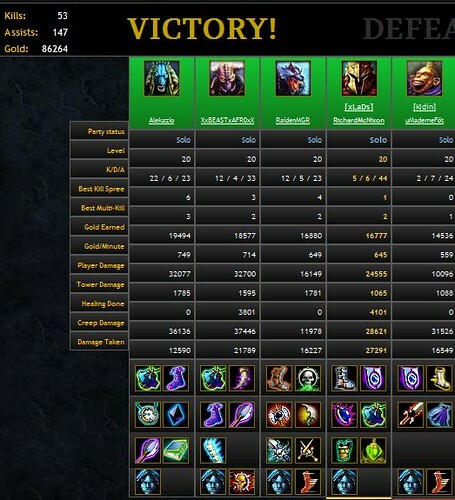 Almost every item in this build has resist yet allows you to build some Damage thanks to Ares' Passive. Although this build has a lot of Aura items they aren't there to simply focus on he's passive. Although there are a lot of alternative Tank items, there are a lot of Aura Tanky items that are just as good... With Auras that simply put your passive to use, so why not use them. This build simply replaces Stone of Gaia with Gauntlet of Thebes and build them earlier on. If you are good at Farming then this build might be more appropriate to you. Gauntlet of Thebes give you a huge amount of Health whilst granting you decent HP5. This build veers away from the Aura builds and focus more on building some Damage. However, it doesn't completely negate all Aura items so as he's passive isn't made useless. Wall of Absolution is used to to be used as both a Tanky yet Damaging item. It lowers the Magical Resist of physical enemys whilst building some Physical Resist. Beings as this build gets a little more Magical Power from Gem of Isolation you will find yourself doing a fair amount of damage but more importantly Slowing the enemy for double the length. When chasing an enemy make sure to use Searing Flesh after the slowing effect from Shackles has dropped off so as Searing Flesh slows also. In the early game (landing phase), make sure to keep an eye on your Mana. The last thing you want is running out and having to return to base, or having no Mana to help you in fights. Try to only use Shackles when going in to fight, here use it 3 times to get the most damage out of it. By doing this, you should find yourself with a pretty juicy amount of Mana at all times and therefore always ready for a fight. This phase of the game is one of the most effective times for No Escape. The earlier the game the less likely the enemy will have brought Purification Beads. It is also the point of the game in which you can use your tower to your advantage. Pulling the enemy in and Stunning them under your tower and seriously secure some quick and easy kills. This is the point in the game where the Laning Phase is diminishing. Try to push your lane and put 90% of your focus in Pushing the Enemy Tower. As soon as you have took the first tower look to the Mid Lane to see if you can Gank it at all, if the Mid Lane isn't pushed and not Gankable then look to the Jungle and clear any camps that are up for that bonus Exp. No Escape is really hurt by this point simply because of the enemy having more time and money to buy Purification Beads. Although you need to remember the 30 second window. After Purification Beads are used to cancel your No Escape you have a 30 second window in which you can cast it again as soon as your ultimate has came of Cooldown. Heavenly Agility also helps you land No Escape on more people as you can charge in unexpected and rip them all back. Thank you for taking the time to read my forth Smitefire guide, I hope I have covered the basics and have achieved what I aimed to do, a simple yet descriptive guide for people new to Ares and the Duo Lane Guide or even Smite. Please get back to me guys, your input really helps me improve my quality of information, im here to help you and if you can help me do that, it is always much appreciated. I throw a Winged Death in there sometimes for the CD reduction and extra HP. I tend to only do this if we're pushing hard on their base and I can afford to. It help secure kills like crazy. Great guide though through and through. 70036 Crepid I throw a Winged Death in there sometimes for the CD reduction and extra HP. I tend to only do this if we're pushing hard on their base and I can afford to. It help secure kills like crazy. Great guide though through and through. I want to like this guide, but it really needs an update. Gauntlet of Thebes is no longer in the game. Also, I think it would be better to just get mana pots than to waste an active slot on Meditation. If you're tanking, you should most likely have HOG3 instead. I could see Heavenly Agility if there are healers on your team, but also consider blink for initiating. 63403 Krayce I want to like this guide, but it really needs an update. Gauntlet of Thebes is no longer in the game. Also, I think it would be better to just get mana pots than to waste an active slot on Meditation. If you're tanking, you should most likely have HOG3 instead. I could see Heavenly Agility if there are healers on your team, but also consider blink for initiating. 2nd time with Ares, this time on Assault and i demolished the game - with a little help from hades and anubis of course - but there were literally 5 kills that i did not have a part in that entire match - and i died a few times at that. SO! despite being "expired" this guide is absolutely still relevant. 15069 RichardMcNixon [img]http://farm4.staticflickr.com/3669/8881973876_a692de9d27.jpg[/img] 2nd time with Ares, this time on Assault and i demolished the game - with a little help from hades and anubis of course - but there were literally 5 kills that i did not have a part in that entire match - and i died a few times at that. SO! despite being "expired" this guide is absolutely still relevant.